The River City Community Band (later renamed River City Concert Band) performs several times a year around the Memphis, TN, area. Norman joined the band in 1983 on bass trombone. On occasion he covered first trombone as well until 1986 when he moved to first oboe.. Yvonne started playing bass trombone at that point. After somewhat over six years, he went to euphonium, then percussion. Also participating toward the end of their tenure with the RCCB (1994) was son Tony on French horn. Even though the family had moved to Oregon a year prior, the family was invited to travel with the RCCB to England in December 1995 to perform in a concert with the band at the Wembley Auditorium. Yvonne played bass trombone, Norm played first trombone, and Tony played French horn. 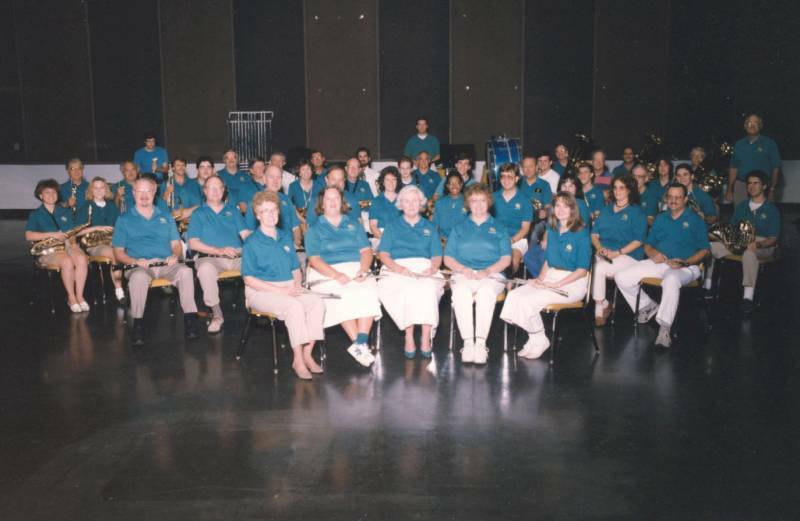 The "official" River City Community Band photo taken around 1992. Director Sidney McKay stands right rear, Yvonne is on bass trombone in front and to the left of the tuba player beside Dr. McKay, Tony is on French horn in front of Yvonne and over two to the left (fourth person from the right of that row), and Norman is on oboe at the right end of the second row. At some point after we left the group, they changed their name to River City Concert Band.